The true story of fish and chips…by Conor Bofin, Honourary Italian (guest post on The Blissful Adventurer) in Michael’s absense (the cad is in Italy again). National fish and chips day-May 30. I am posting here with Michael because it is an excellent thing to do. It is one small way of giving something back to my Irish Italian friends and another small step on the road to getting Michael and his wife over here to Ireland (with some fine Italian wine). Italy: It’s 4 PM. 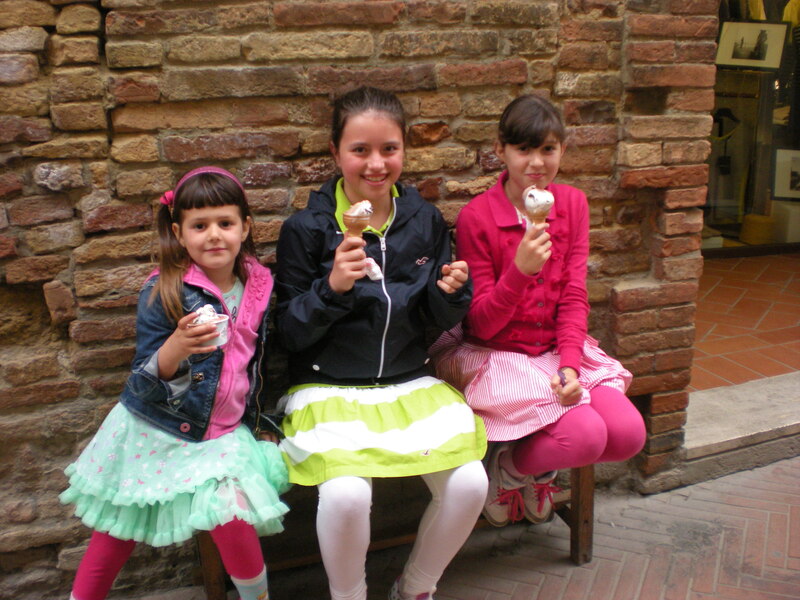 Have You Had Your Gelato Yet? “My mountain of gelato is so much prettier than your mountain of gelato!” But there are rules for eating gelato, as Michael Tucker says in Living in a Foreign Language: A Memoir of Food, Wine, and Love in Italy: “Italians follow a very strict code when it comes to eating, and one hard and fast rule is gelato at four o’clock.” Carol, my sister-in-law, and I managed to get gelato in Rome just about every day. We didn’t quite follow the four o’clock rule, but no matter. Gelato is good any time of the day. 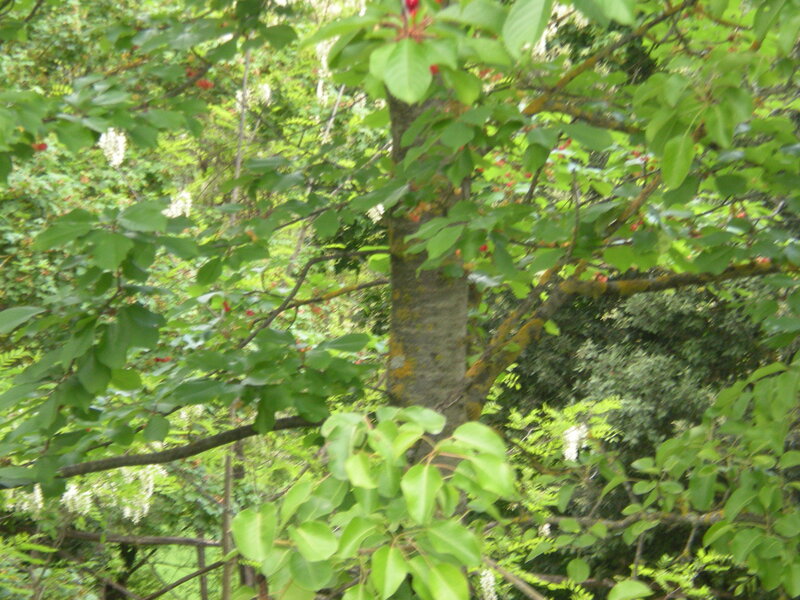 My favorites: frutta di bosco (mixed berry-“fruits of the forest”), fragola (strawberry), and limone (lemon). Carol liked coco (coconut) and cioccolato (chocolate). Of course, we tried many other flavors: caffe (coffee), melone (melon), mango, creme caramel, straciatella (vanilla with chocolate flakes), and pistachio. 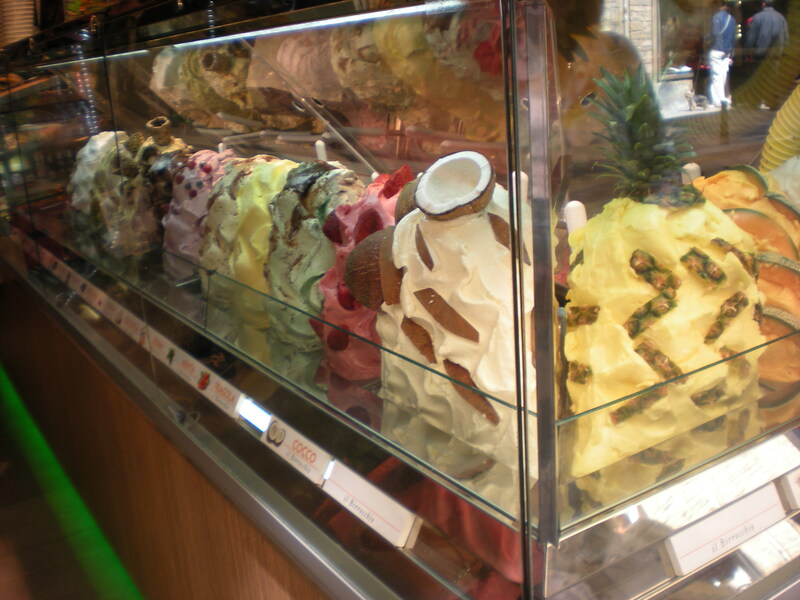 You can have your gelato in a cono (cone), a coppa (cup), gusto (double-dip), or any other outrageous way. 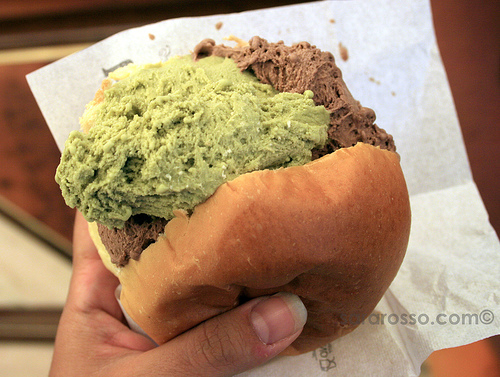 Photo by Laura Griffin as seen on her blog post, “Roman Holiday.” You can even have gelato on a brioche (sweet bun). Read about that gourmet treat here. But purists will never get gelato in a cone or on a bun. Heavens, no. 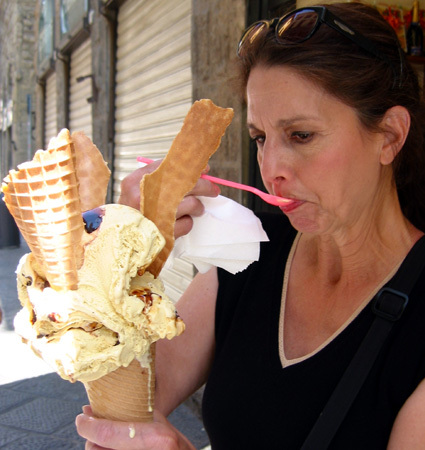 That would contaminate this icy confection’s pure flavor and texture! A cup with a teeny plastic spoon is the only acceptable way to eat gelato. 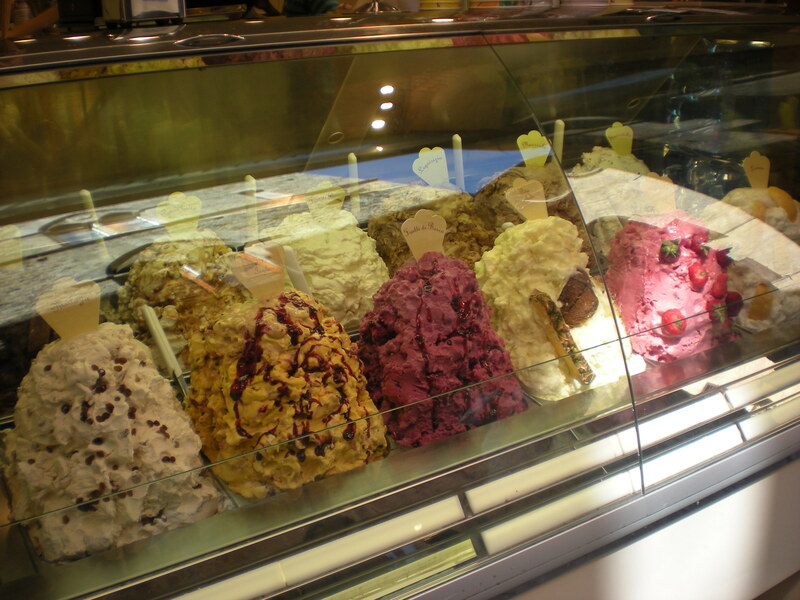 Gelato is made a little differently than our American ice cream. It is made with whole milk, eggs, sugar, and flavoring, but it has a lower butterfat content than our ice cream. It has a creamy, smooth texture, and it is not frozen hard, so you can eat it faster without getting an ice cream headache! 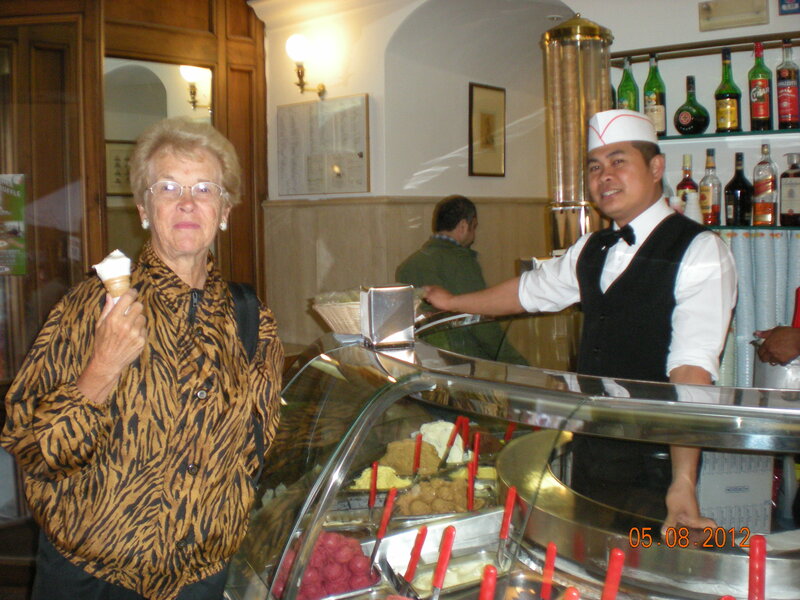 If you go to Italy, just remember the rule: Gelato at 4 p.m. (and any other time you want it). I promise, you will love it. What a thrill to be selected by my writing peer, Elaine Smothers, to receive this Versatile Blogger Award. This award encourages bloggers to read and support other bloggers. It is gives tangible recognition to the time and effort it takes to develop and maintain a blog. It also emphasizes WANA: We Are Not Alone in this blogging world! Kristen Lamb has helped to ensure that! Read all about it in Kristen’s book We Are Not Alone:The Writer’s Guide to Social Media. I met Elaine in Kristen Lamb’s WANA112 blog group, and I have followed her blog ever since she and Forrest started it. Who is Forrest? I’m glad you asked. Forrest is Elaine’s very capable, red-eyed assistant. See how distracting Forrest is? He is just so darn cute! First. Thank the person who gave you the award and link to their blog. Done! Thanks again, Elaine and Forrest. Second. Nominate 15 blogs that you enjoy and present this prestigious award to them. This is a bit tricky as we bloggers tend to read a lot of blogs. But here are my 15 bloggers. Some are WANA friends, some are A-to-Z Challenge friends, some are travel friends, some I met in random ways (like reading blogs with interesting names or loglines), others have been recommended by blogger pals. Shout with emaginette Live Life and Shout About It! Last task, tell 7 random things about myself. Here goes. 1. Born a South Jersey farm girl, I have lived outside New Jersey more than I have lived in it. I went off to college at age 18 and returned to SJ when I reached retirement age. Can a little farm girl from South Jersey find success in the big outside world? Well, yes. 3. So what do you do in Alaska in the dead of winter? You join groups. An actress I am not, but I once played a lead role in a small-town production of “The Most Eligible Bachelor in Town.” I was that hussy who was after the bachelor (actually, he was already my husband, but no matter). This was the production of the year in the tiny Anchor Point, Alaska theater group. As I recall, we had two performances. I don’t remember whether the crowd stood up to give a standing ovation, or if they just needed to stand up to get their heavy winter coats on. We’ll just say we had a supportive crowd! We had fun anyway. The theater group disbanded soon after this star performance. 4. I prefer hot weather over cold. After Alaska, I moved to Hong Kong to be principal in the Lower Primary Division, Hong Kong International School. With over 700 children ages 4 to 8 in my division, I kept pretty busy. I worked with an incredible bunch of talented teachers and loved almost every minute of it. Being in Hong Kong allowed me to explore Southeast Asia. Gotta blog about that one day. 5. 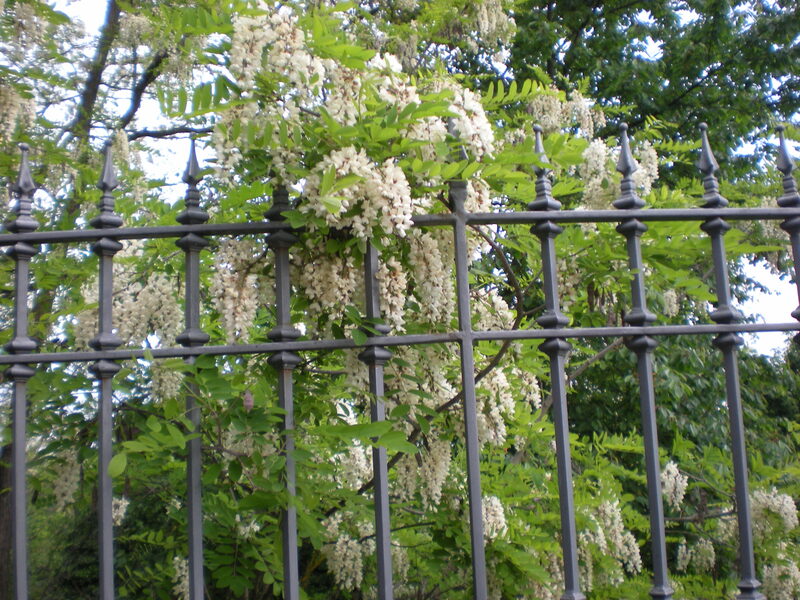 Blogging is a relatively new interest for me. 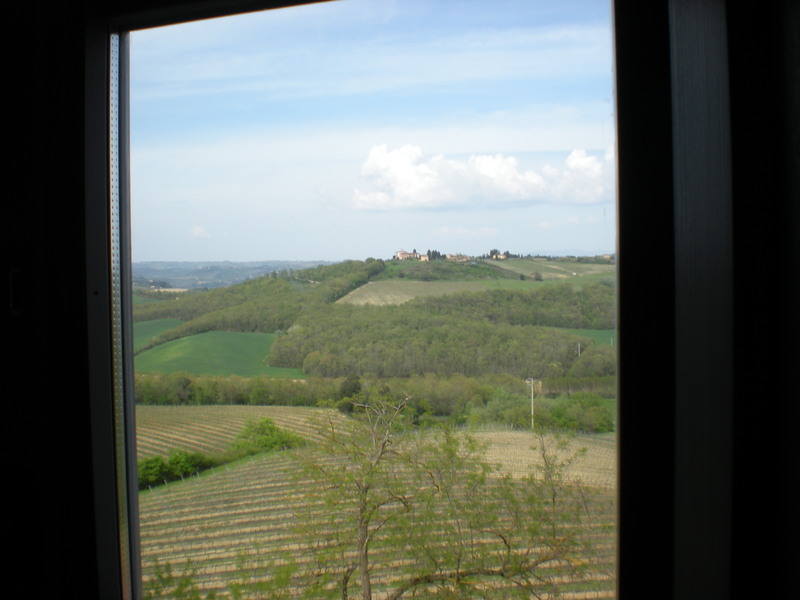 I love to read blogs about travel, cooking, food, writing, blogging, nonfiction books, YA, KidLit, education, technology, and more. I also love photo blogs. And I did survive the A to Z Blog Challenge in April (writing 26 posts in 30 days), but my normal posting will probably range between eight and twelve postings a month. 7. Did I mention that I love cats? Well, I do. I currently don’t have one because I like to travel, but when I grow up and settle down, I’ll probably get one. Now I look forward to reading new blogs suggested by my 15 Versatile Bloggers. Happy blogging everyone. Remember WANA! 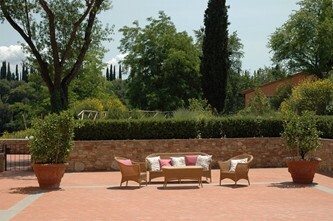 Our home away from home: Il Borghetto, a restored villa located between Poggibonsi and San Gimignano in Central Italy. 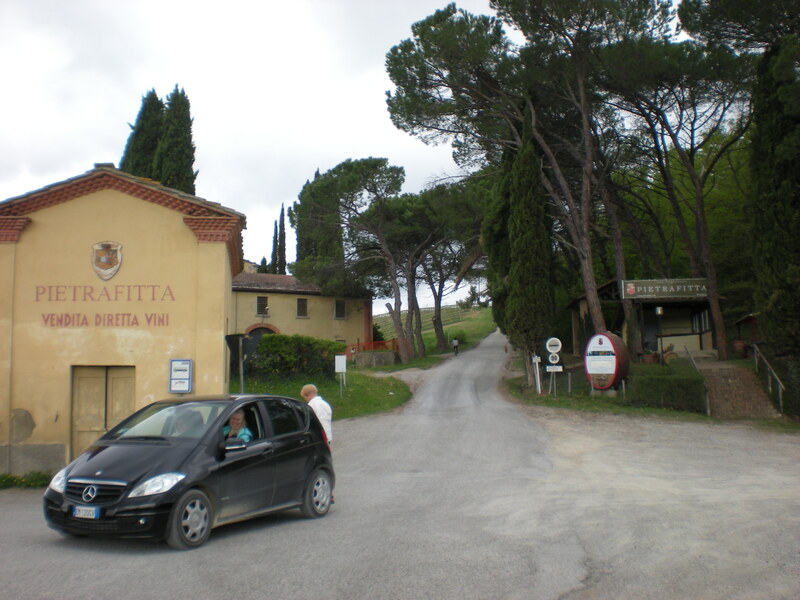 Il Borghetto, once a part of Villa Pietrafitta, sits atop a hill at the end of a long, winding gravel road. 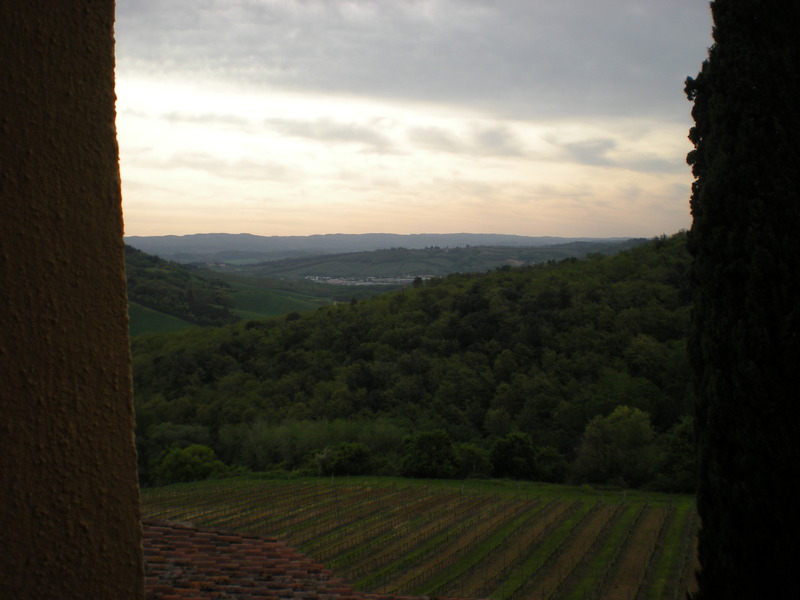 From the moment we enter through its gates, we seem to be in another world, yet we are close enough to make day trips out to visit Siena, Lucca, Pisa, Volterra, and Florence. 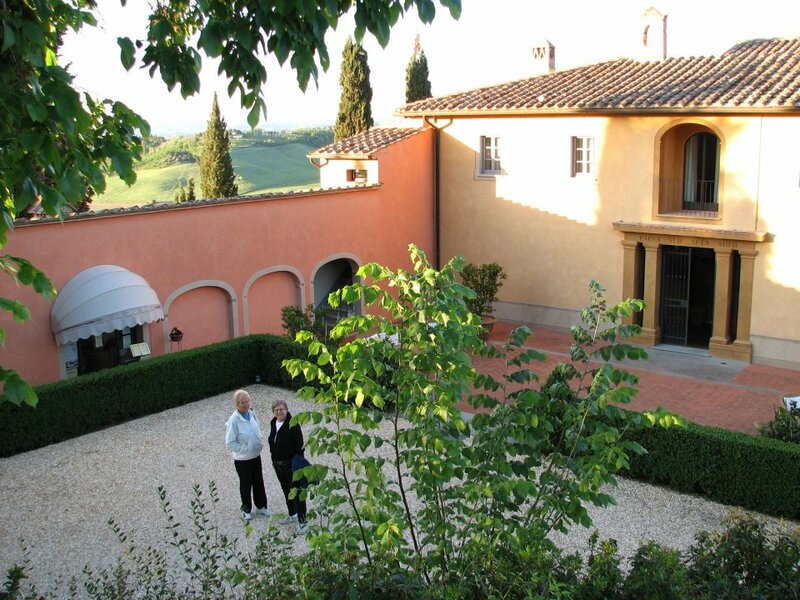 The Bimbi family owns the villa, and they are most gracious, courteous, and friendly to all of the guests. 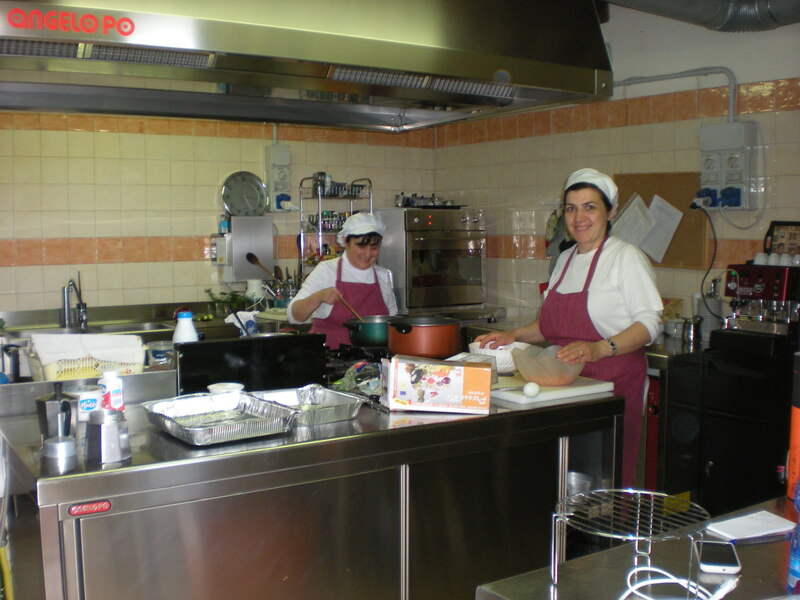 Mamma Silvanna and her assistant chefs prepare outstanding Tuscan specialities for our special candlelight dinner outside under the pergola. On cold and rainy nights, dinner is served in the elegant La Stanza del Duca (the Duke’s Room). For one of the dining evenings, the menu featured a variety of bruschetta, a delicate green lasagna with delicious pink cream sauce, pork loin and sauteed fresh vegetables, and tiramisu and coffee. 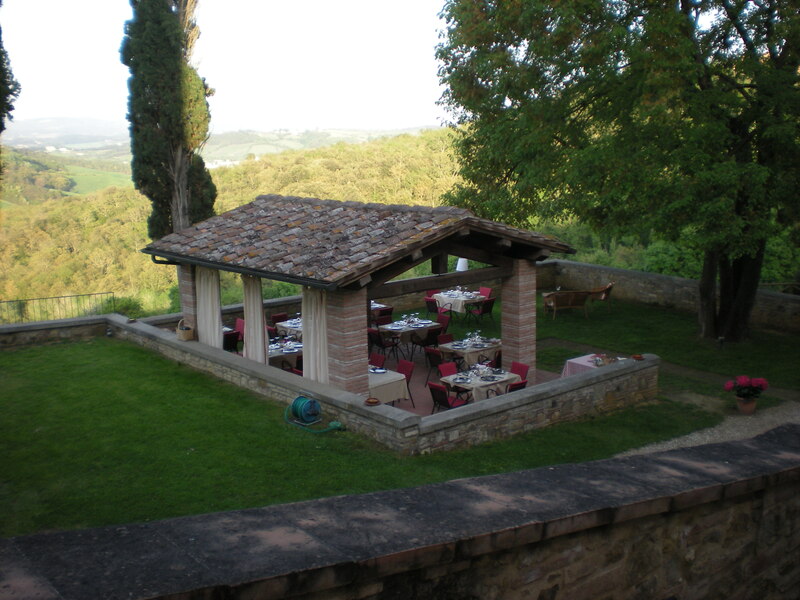 Patrizia, one of the chefs, offers cooking classes for anyone interested in learning to cook Tuscan recipes. 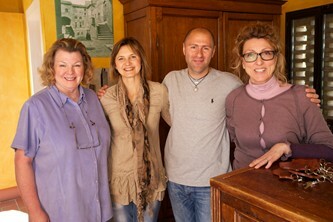 Il Borghetto staff photo by Il Borghetto. 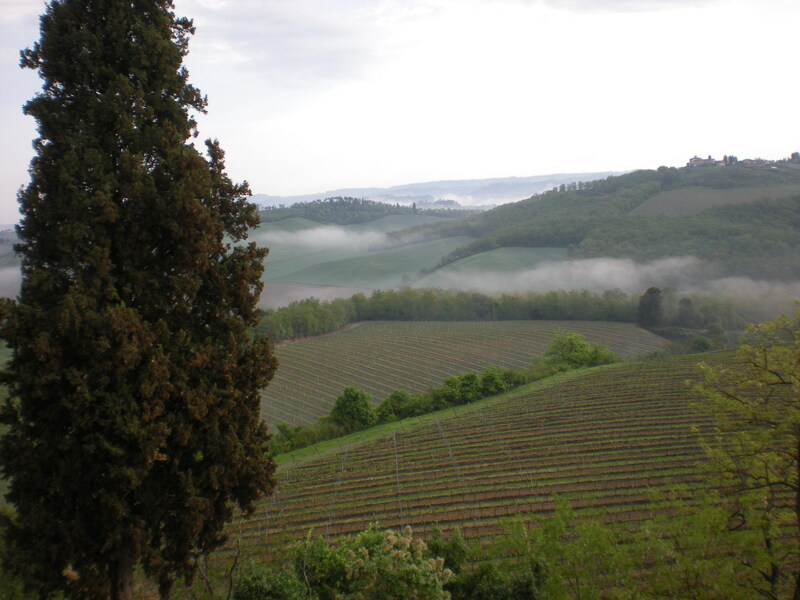 The scenery around Il Borghetto is incredible. 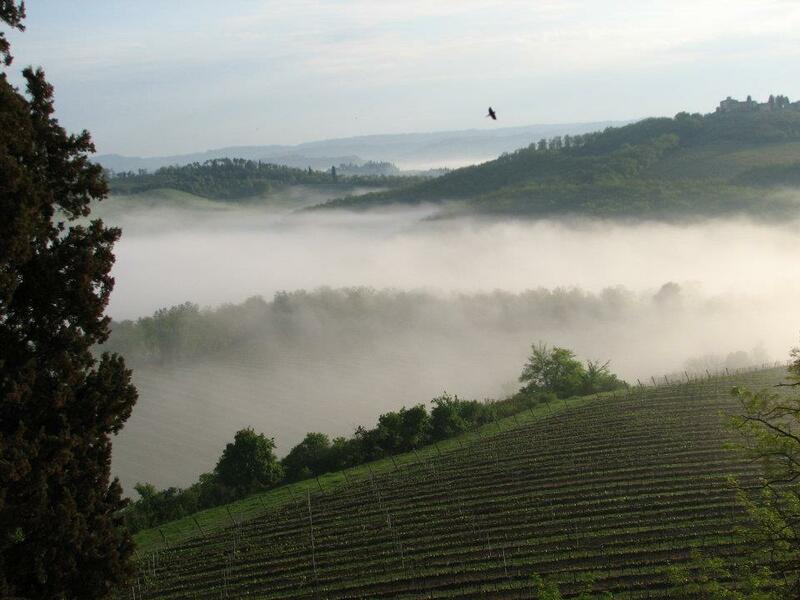 The views from our windows are spectacular, especially in the early morning mists. 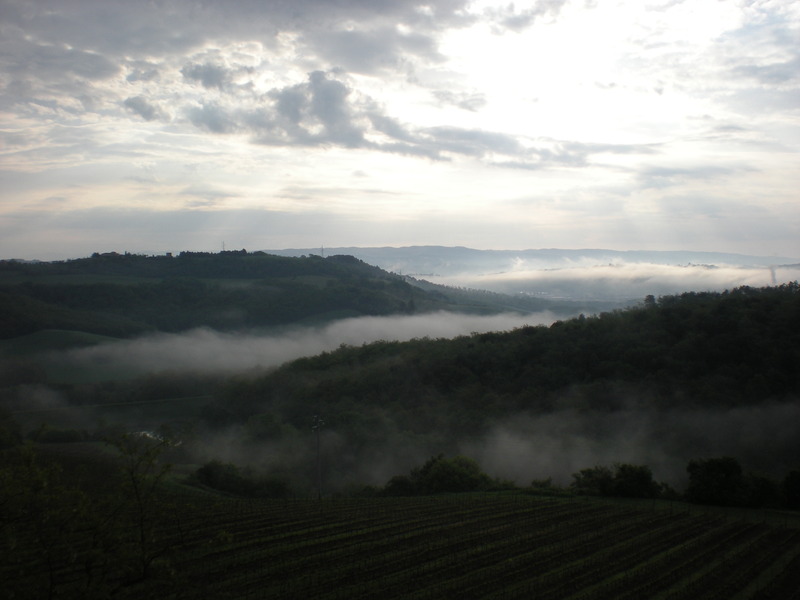 Morning mists photo by Christine Kolstad, fellow traveler. 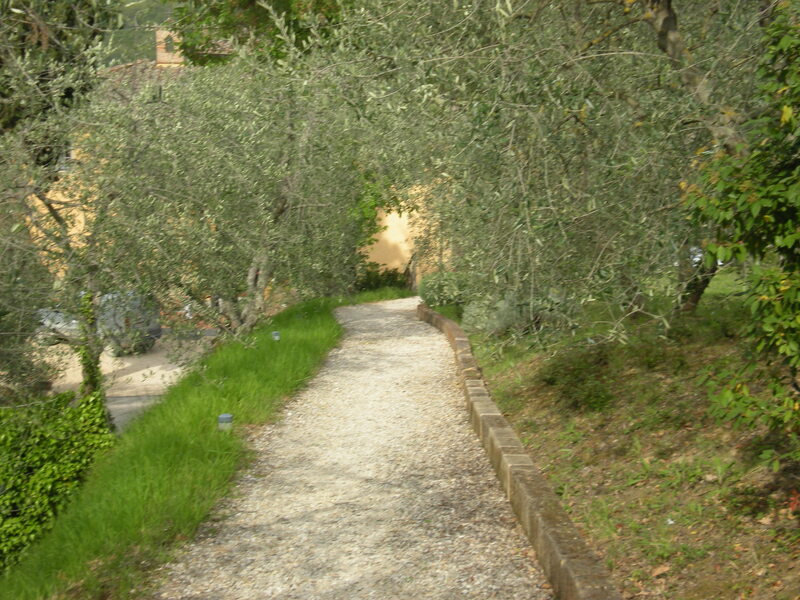 Hiking paths through the olive groves beg to be explored. 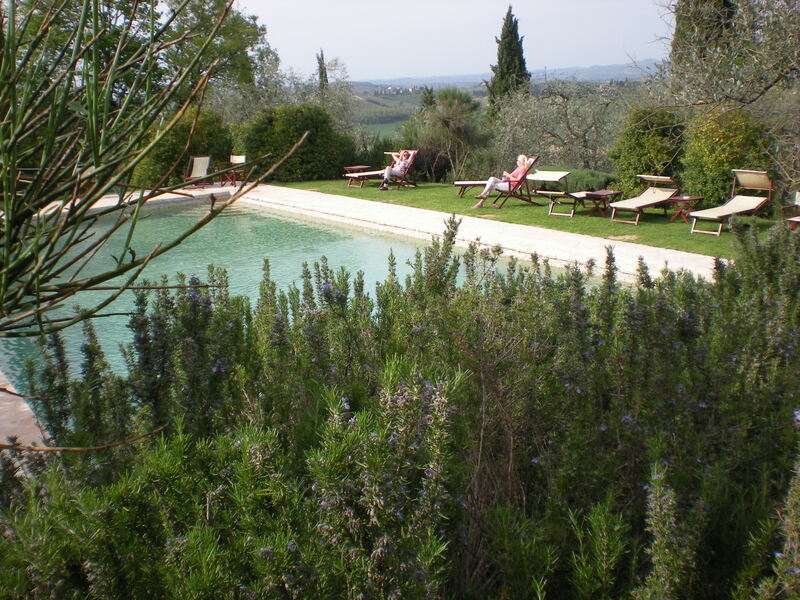 At the end of our hike, the villa pool invites us to cool off with a late afternoon swim. 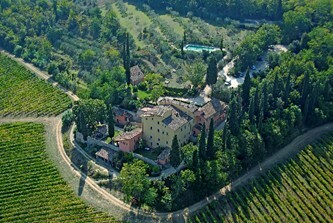 All this and we have been in Italy only one day! 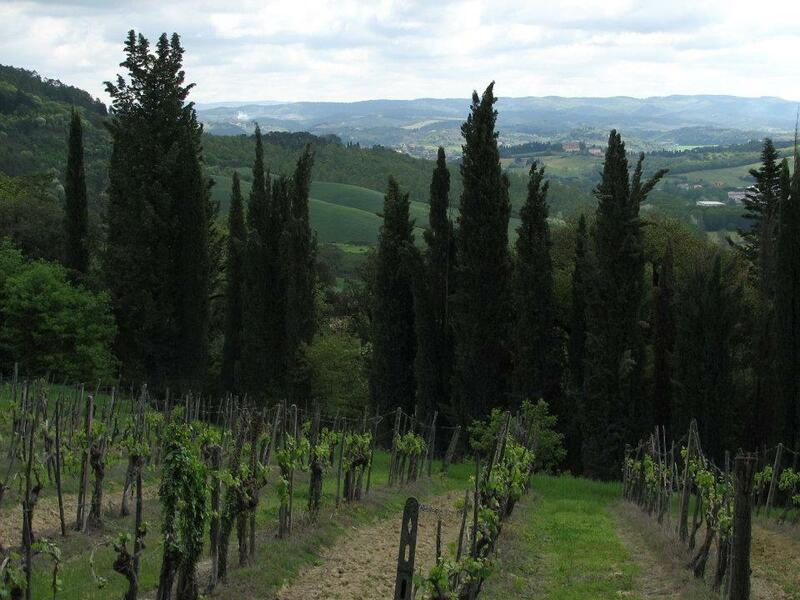 Tuscany: a region of Central Italy, formerly a grand duchy (a territory ruled by a duke or duchess); an exquisitely beautiful setting, aloof and apart from the outside world; quiet, serene. Sounds and sights and scents of a perfect setting command our full attention. My companions (sister-in-law, Carol; niece, Christine; and friend Inger-Anne) want to miss nothing. 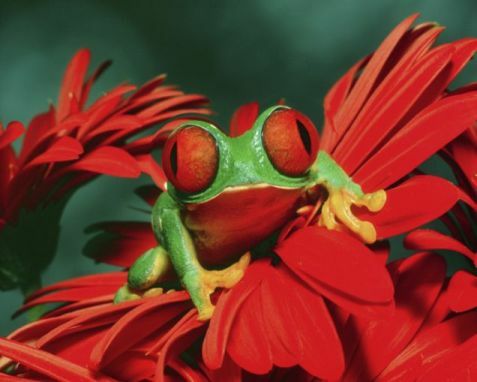 We gape wide-eyed at everything in sight. We listen. We smell. We touch. We taste. 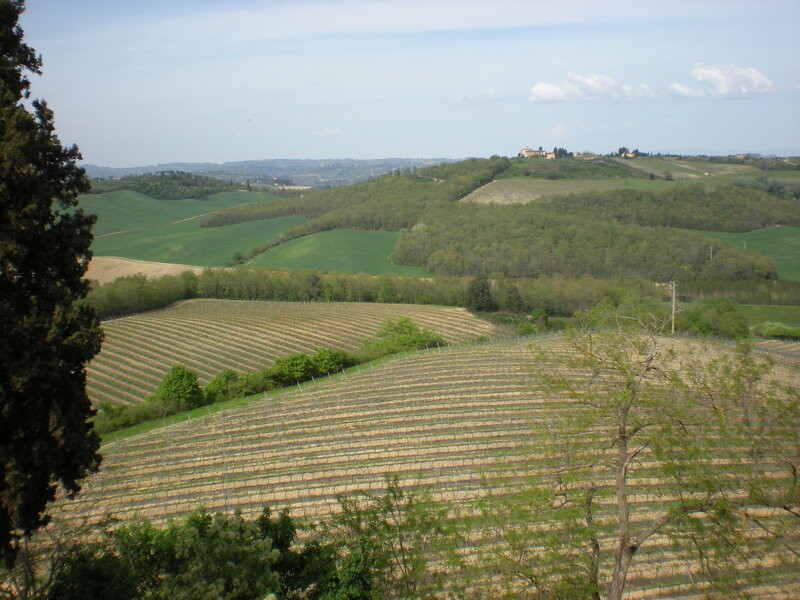 Variegated patchworks of spring greens cover rolling hills and valleys as far as the eye can see, holding us captive to the beauty of Tuscany. 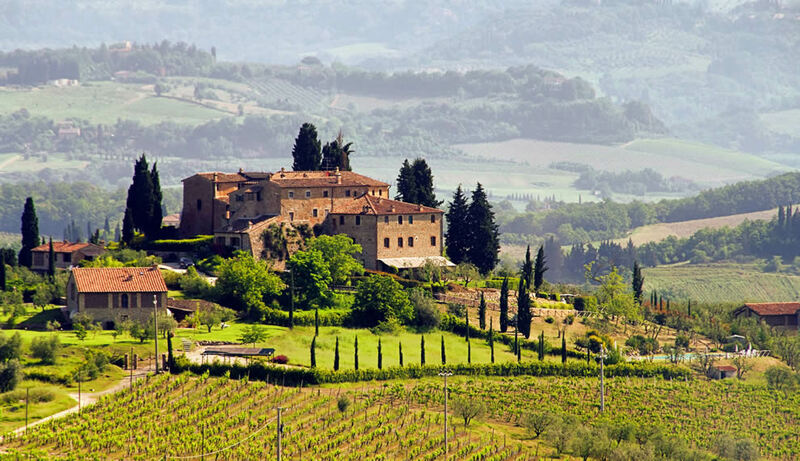 Yellow, orange, tan, and apricot-colored villas with clay tile roofs crown many hilltops, standing majestically in time. 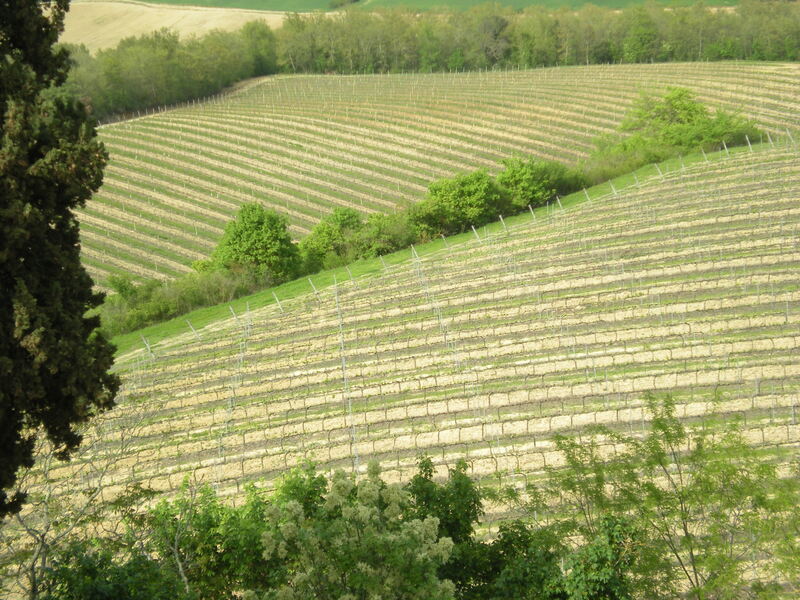 Symmetrical rows of carefully pruned grapevines line the hills in orderly array, soaking up the warm afternoon sun. 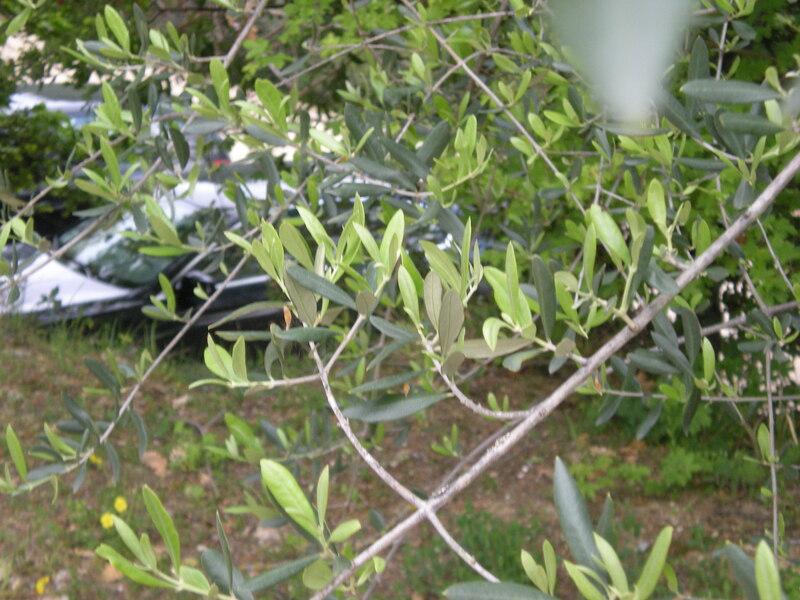 Dusty green olive trees show their new spring-green leaves amidst the dark green of last season, getting ready to produce new fruit. 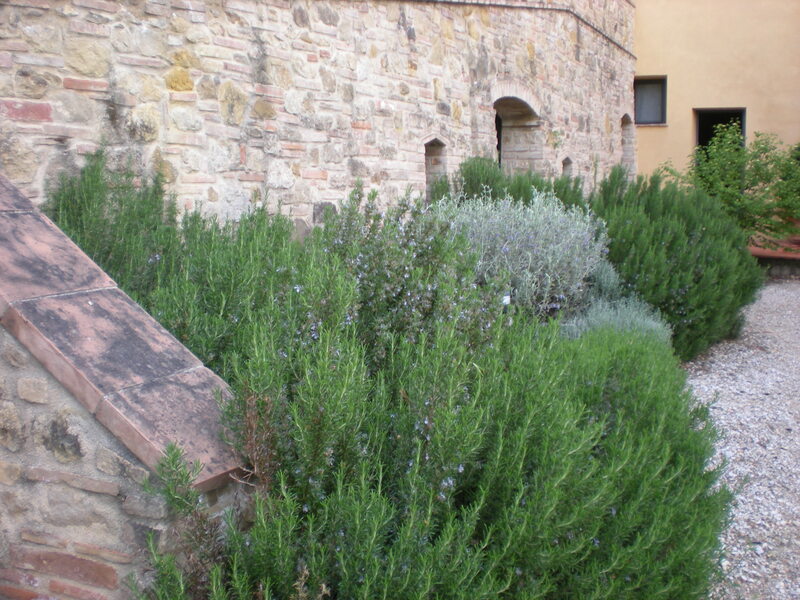 Climbing white wisteria and light blue flowers of rosemary bushes scent the air, teasing our senses. 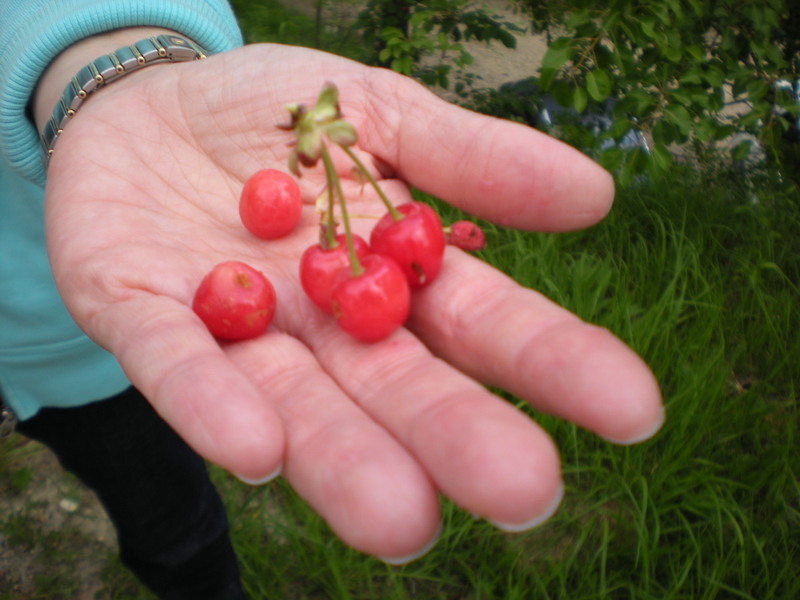 Wild cherries beg to be picked and eaten. 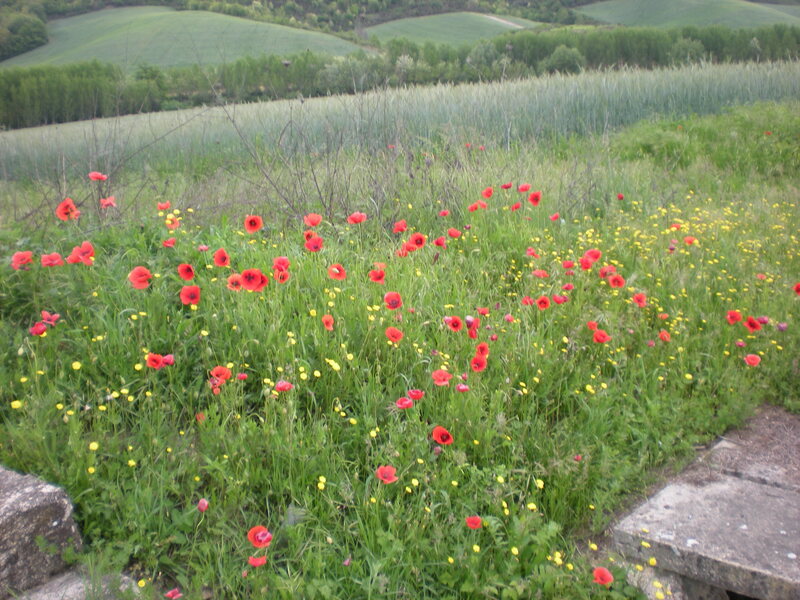 Red poppies stand royally among the roadside weeds. 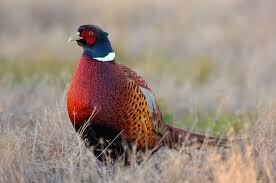 Two ring-tailed pheasants run through tall grass in an olive grove, evading our curious eyes and ready cameras. 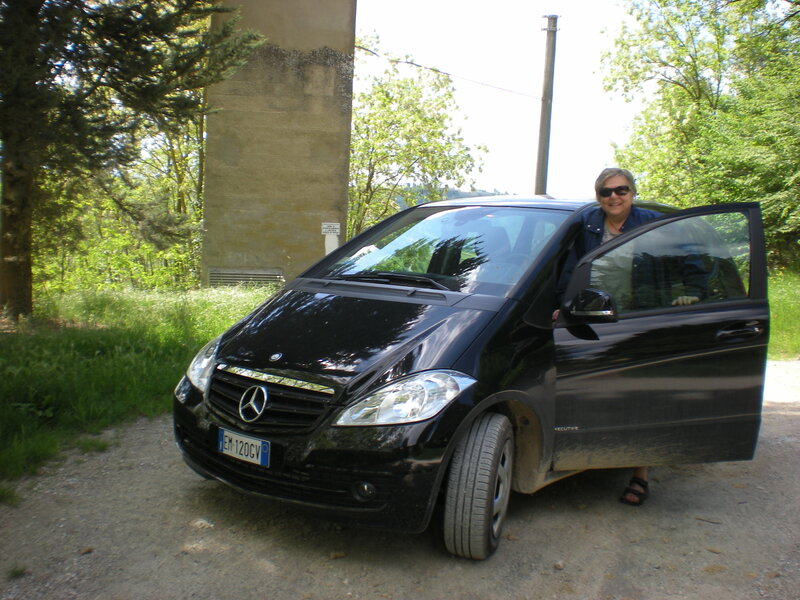 Our car’s tires (A Mercedes!) 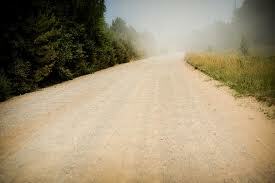 crunch and bounce on the rutted gravel road, leaving a trail of flying dust. 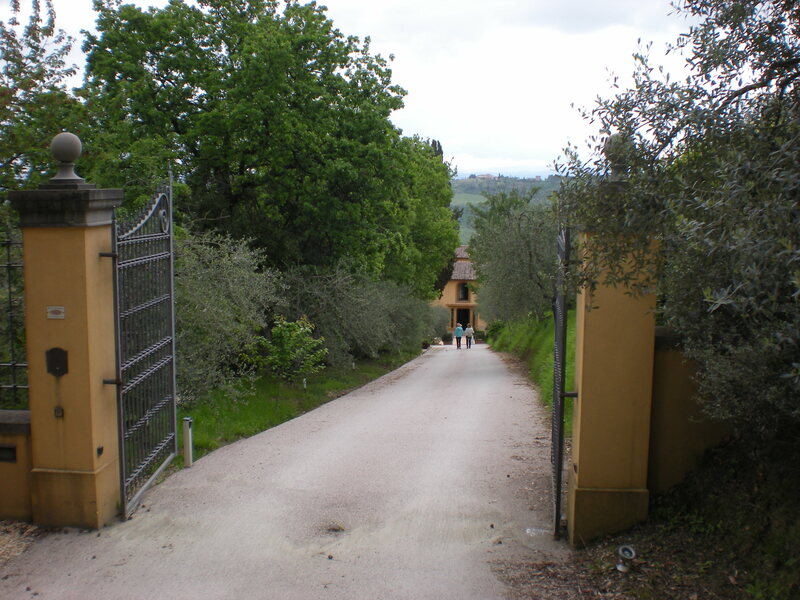 We hum as we try to match the sound of our car’s tires on a short piece of pavement oddly interspersed on the long twisting gravel road that climbs to our hill-top villa: Il Borghetto. 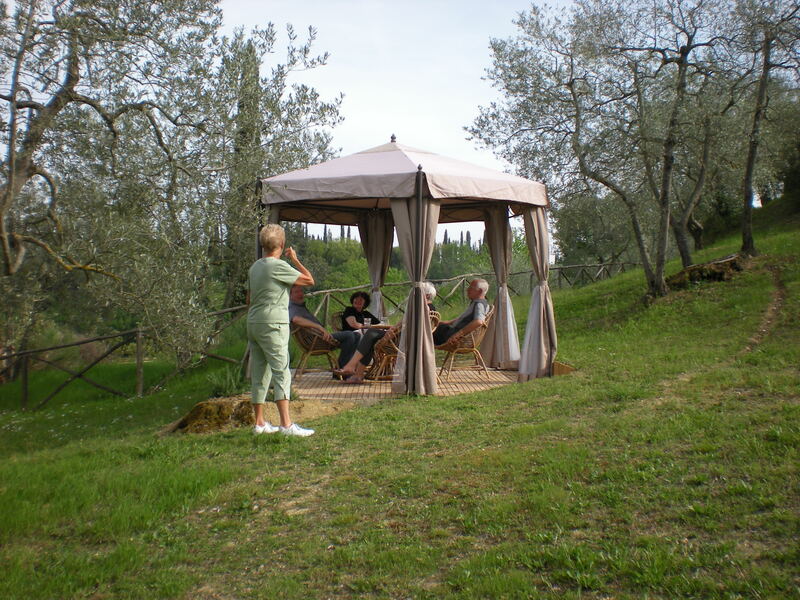 Welcome to Tuscany and an adventure in history, culture, and beauty. 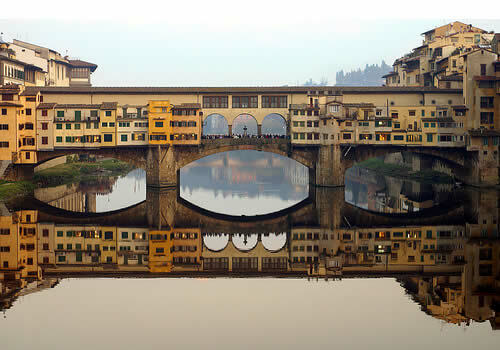 Want a fun way to get a quick orientation to Florence? Try a bike tour. 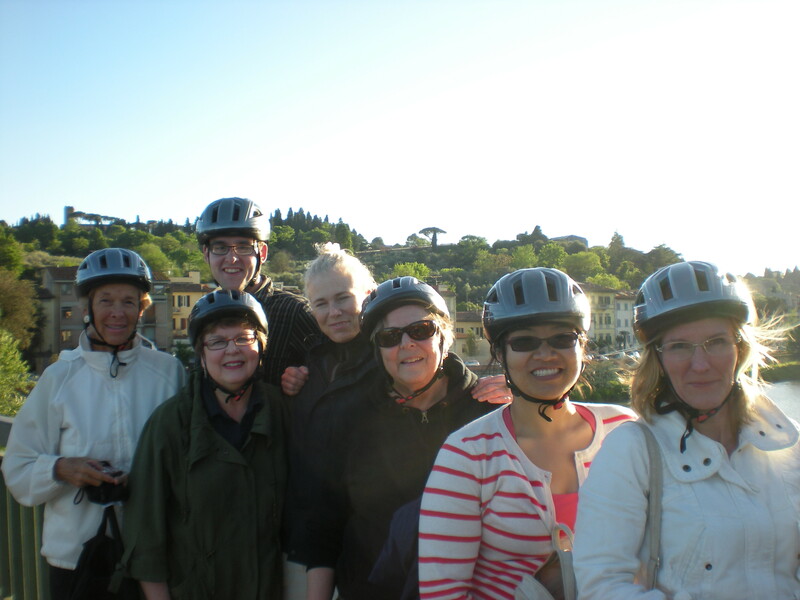 On our recent trip to Italy, my travel companions, Carol, Christine, Inger-Anne, and I joined three others travelers and our tour leader, Valentina, for an exhilarating early evening bike tour around Florence. Not only did we get a general orientation of the city on the bike ride, we got a little exercise and made some new friends. 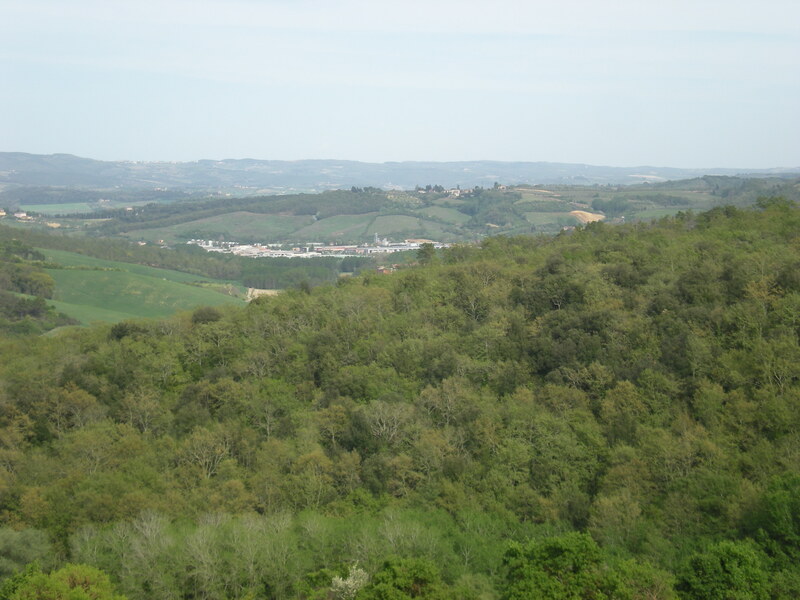 Florence has a flat landscape, so the challenge level of our tour was just right. 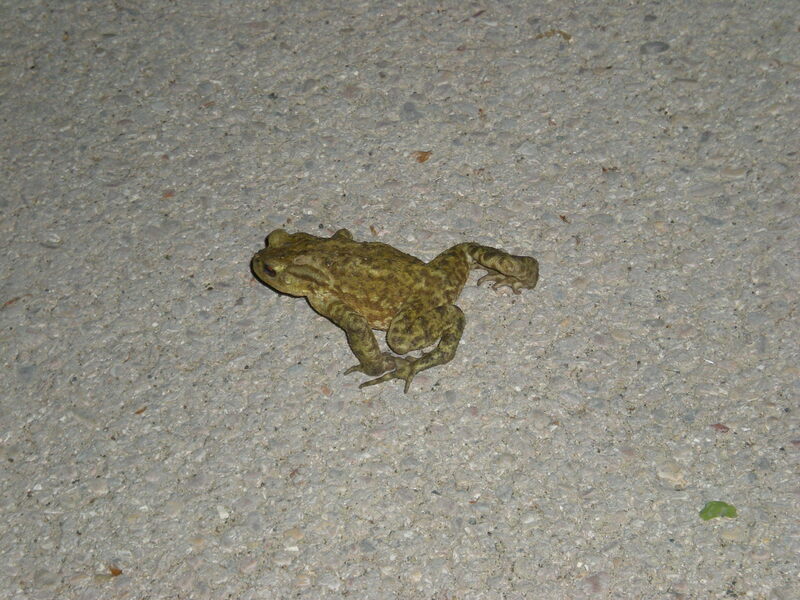 The evening tour lasted two-and-a-half hours and covered eight kilometers. 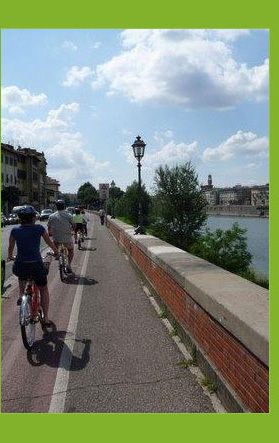 In a bold and innovative move in 1988, the leaders of Florence banned all cars from the center city streets making them safer, not only for pedestrians, but also for our little bike tour. The only mishap on our tour occurred early in the trip just a few blocks from the bike tour office. Christine’s bike threw its chain, and our intrepid, multi-talented tour leader, Valentina, after first attempting to fix it, quickly wheeled the bike back to the shop for a replacement. 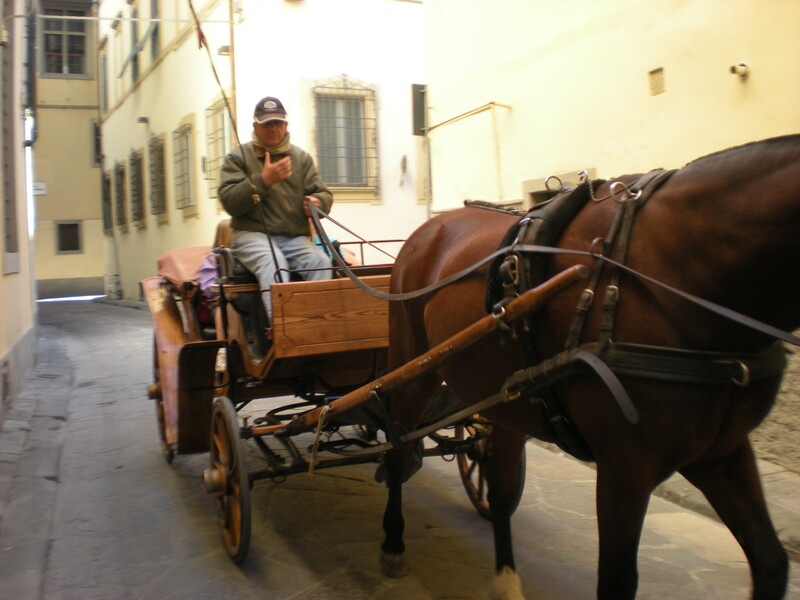 The rest of us chatted in a traffic-free alley; that is, until a horse and carriage driver came along and offered us a ride home. We declined. Minutes later, Valentina returned with a new bike for Christine. 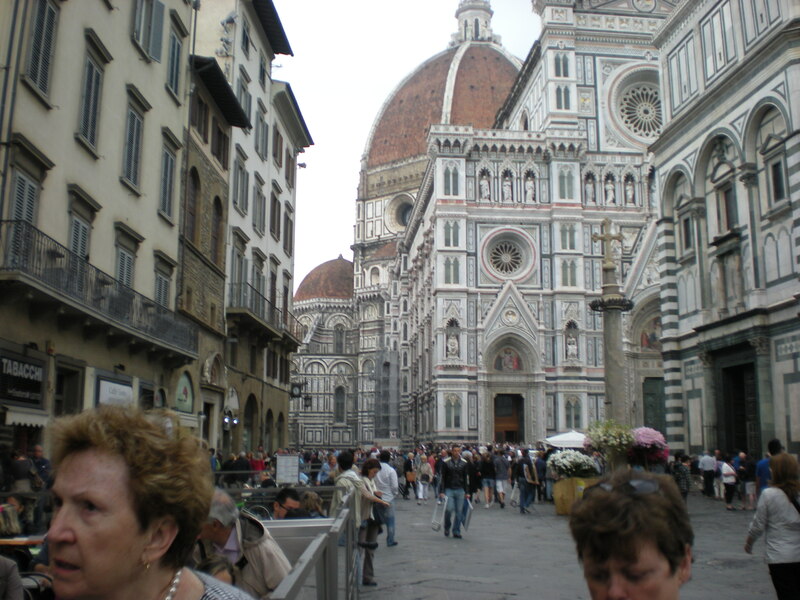 We continued on our journey, stopping at various points to hear important information about historical, political, cultural, and economic events, structures, and artifacts of Florence. As we were were riding through Florence, hearing those famous and notorious historical names, I couldn’t help but remember my Gordon College history professor, Dr. David Franz, our European Seminars, and my first European traveling companions. That was exactly 50 years ago! 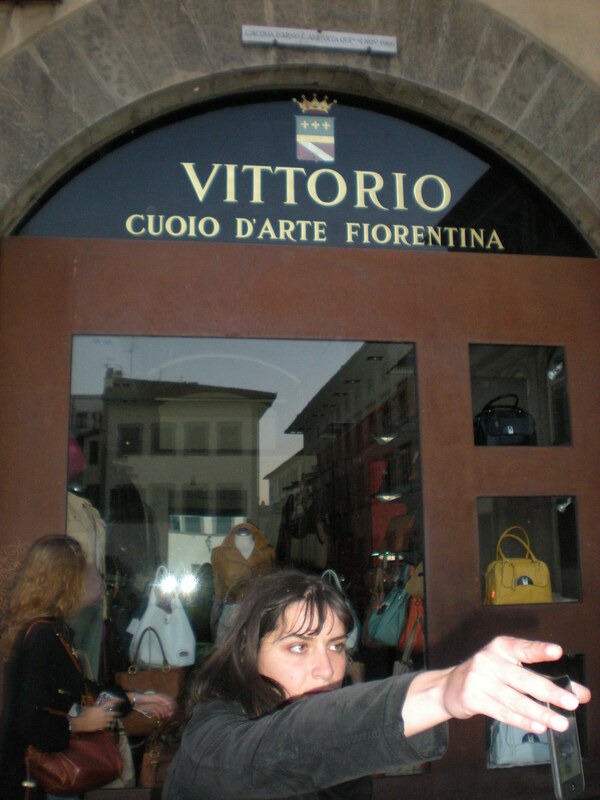 Valentina led us first to the Piazza del Duomo, one of the most popular tourist spots in Florence. This piazza was a bit crowded with tourists, so we had to use our little ta-ling, ta-ling bike bells to warn pedestrians of our presence. 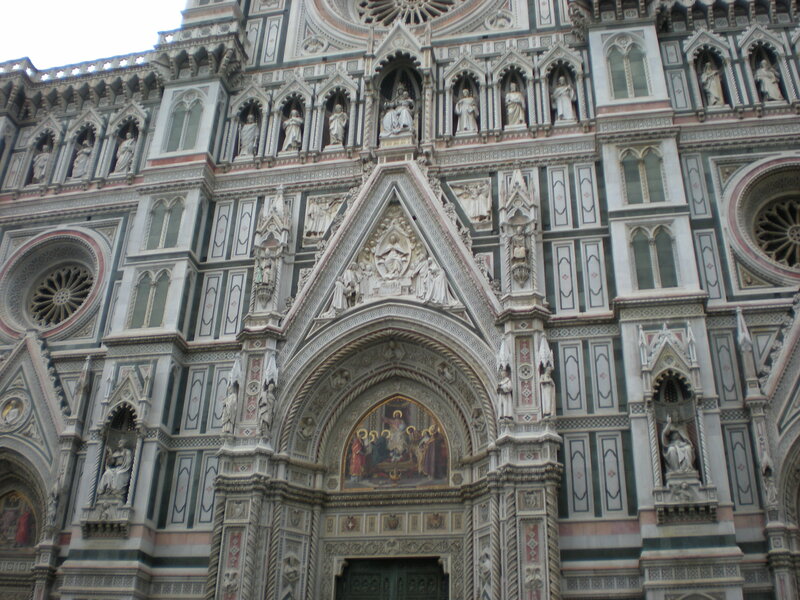 The Cathedral Santa Maria del Fiore (Holy Mary with Flower) dominates the Piazza del Duomo. The original church on this spot, the Santa Reparata, was built in the fourth century but razed in 1296 to make way for the current cathedral. 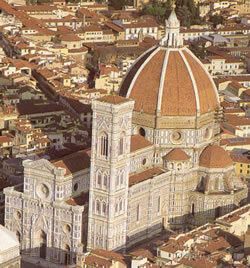 The cathedral’s huge dome, designed by Filippi Brunelleschi in 1420, took twenty-six years to finish and is a major architectural achievement. The Campanile (bell tower), designed by Giotto in 1334, was completed in 1359. The cathedral’s red, white, and green marble facade was finally completed in 1887. This cathedral has a long history! 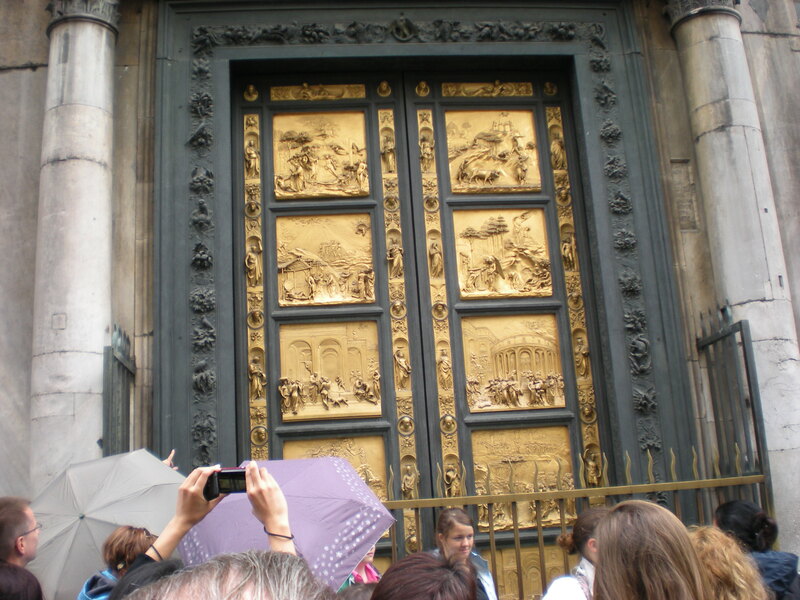 We parked our bikes for a few minutes while Valentina pointed out the “Gates of Paradise,” the East Doors to the Baptistry, designed by Lorenzo Ghiberti in 1421 to mark the end of the great plague that killed so many Europeans. These doors featured new design ideas, replacing the Florentine Gothic style and opening a new period in history: the Renaissance. The doors depict ten major biblical events. 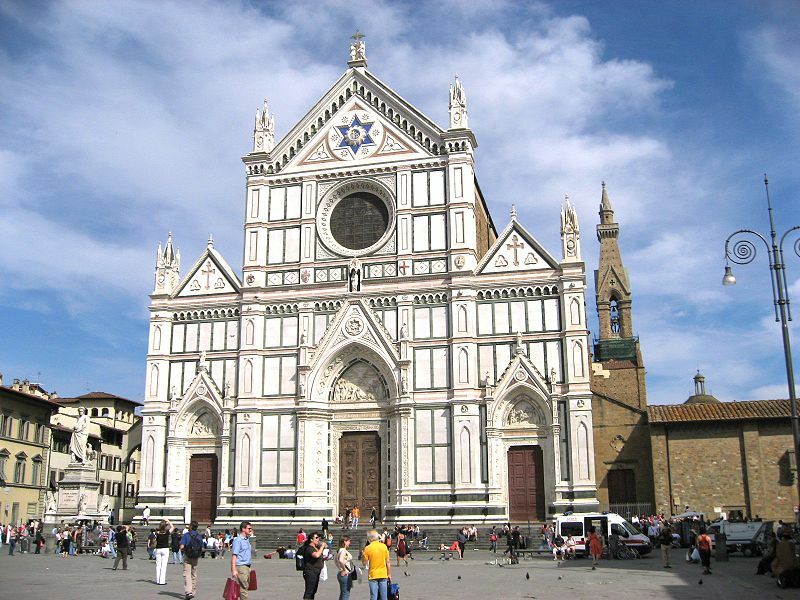 Next stop: Santa Croce (1294), the church where Michelangelo (1475-1564, artist, sculptor, architect), Galileo (1564-1642, astronomer, mathematician, and physicist), and Machiavelli (1409-1527, author of The Prince, the original how-to book on political ruthlessness) are buried. 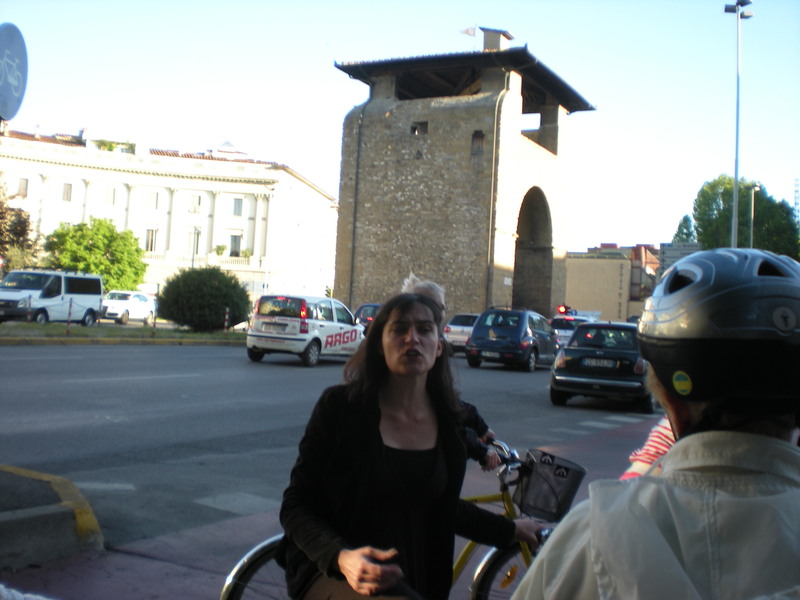 At one point on our tour route, a crowd gathered at a busy corner on both sides of the bike path. They waved their jackets and cheered us on as though we were Olympic champions on our final push to the finish line and our gold, silver, and bronze medals. Wish I had gotten a picture of that! We stopped on a bridge crossing the Arno for a group picture (sans Olympic awards), then rode along Lungarno Torrigiani towards the Ponte Vecchio. Valentina pointed out the high-water mark, 19.5 feet above street level (the white bar above the arched window of Vittorio Cuoio D’Arte Fiorentina) from the Arno floods of 1966 that caused significant damage and loss to irreplaceable art treasures. Restoration of some of those art treasures continues even today. 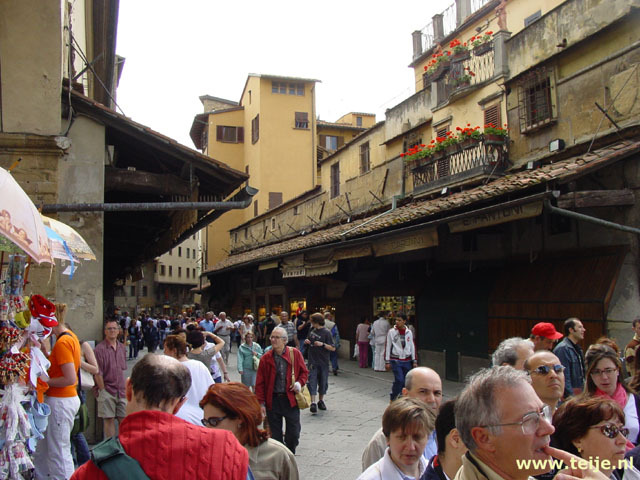 At the Ponte Vecchio, the oldest existing bridge in Florence, and the only one to survive WW II bombing, we politely walked our bikes through the crowd strolling amongst the gold and silver shops. We definitely planned to visit this unique and bustling spot again and mayby even leave a few euros there. 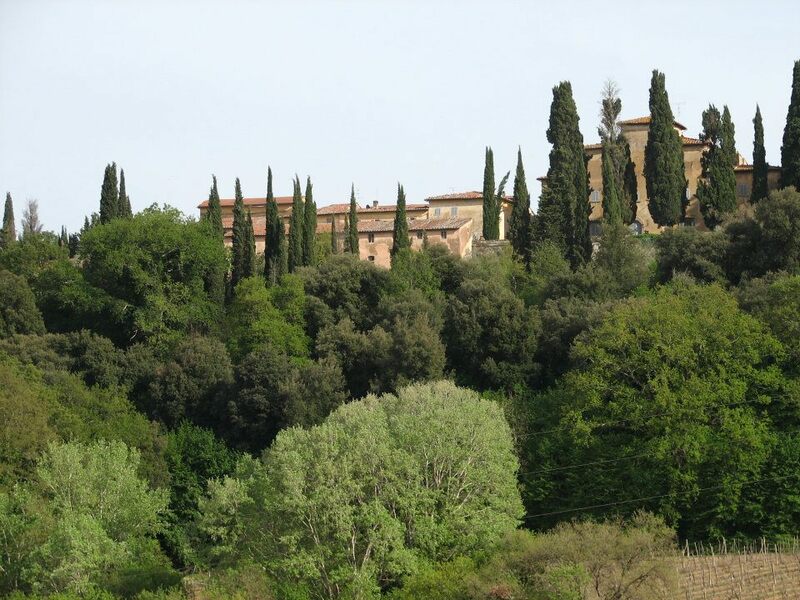 The very powerful Medici family ruled in Florence from 1434 until 1743 with brief interruptions. 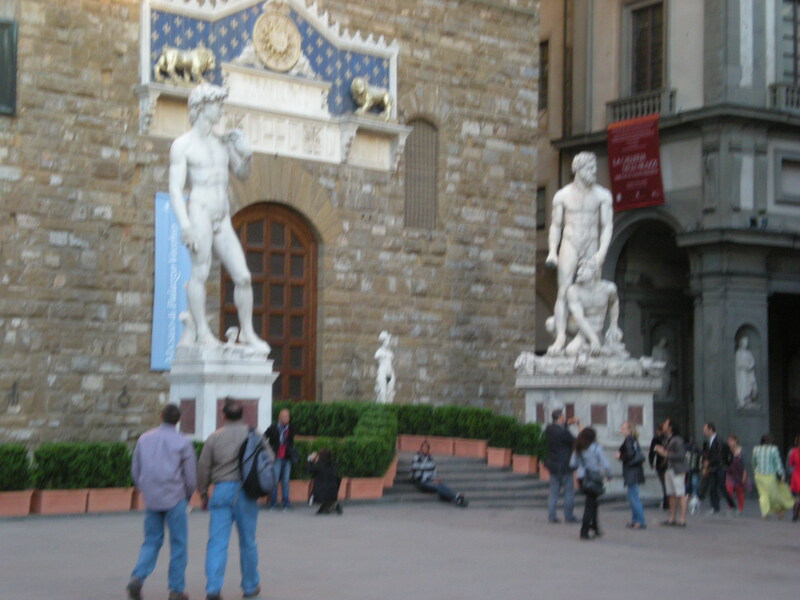 They were patrons of the arts and commissioned some of the great Renaissance works that are now housed in the Uffizi Gallery. Across the Arno River, the Palatine Gallery at the Pitti Palace holds more medieval and Renaissance paintings. 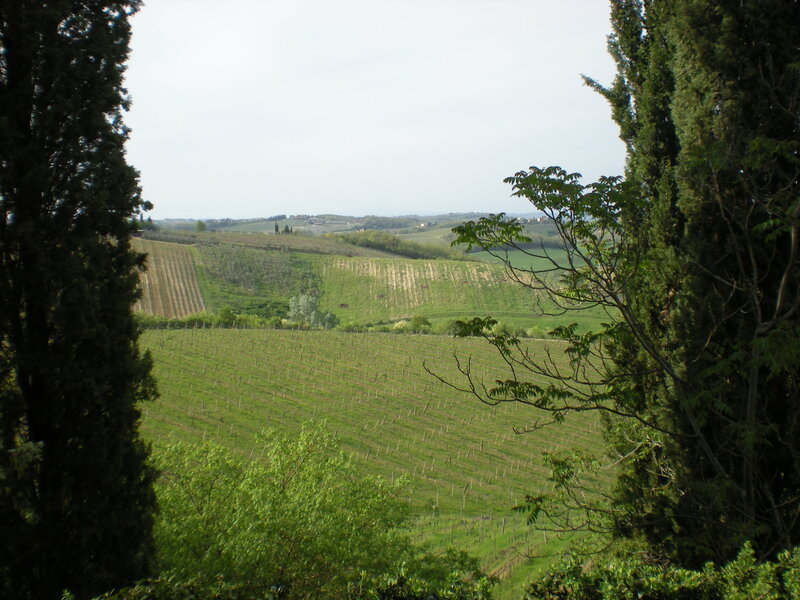 After a number of turbulent years (including World Wars) Italy became a democratic republic in 1946. Twelve million voters rejected the monarchy in a referendum. 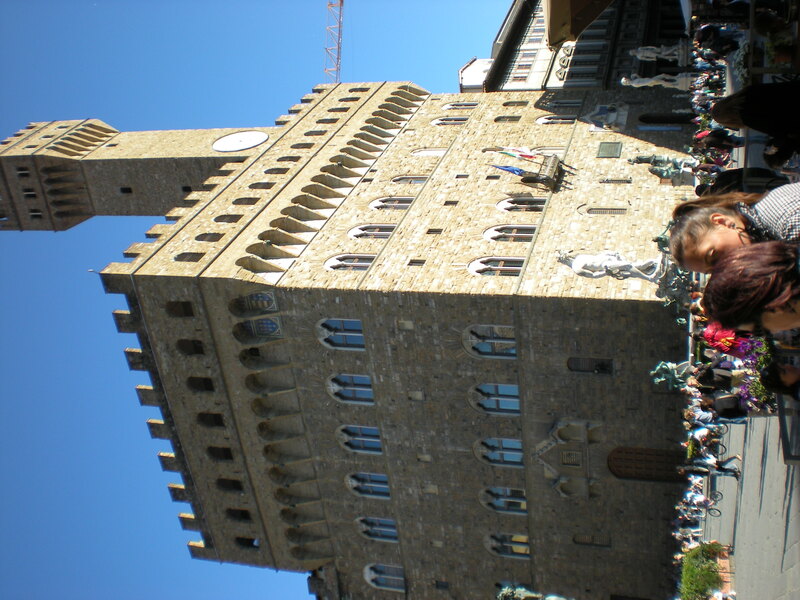 The political, religious, and economic aspects of Florentine history are so intertwined. It is fascinating to dig into the details, but it can also become quite confusing! 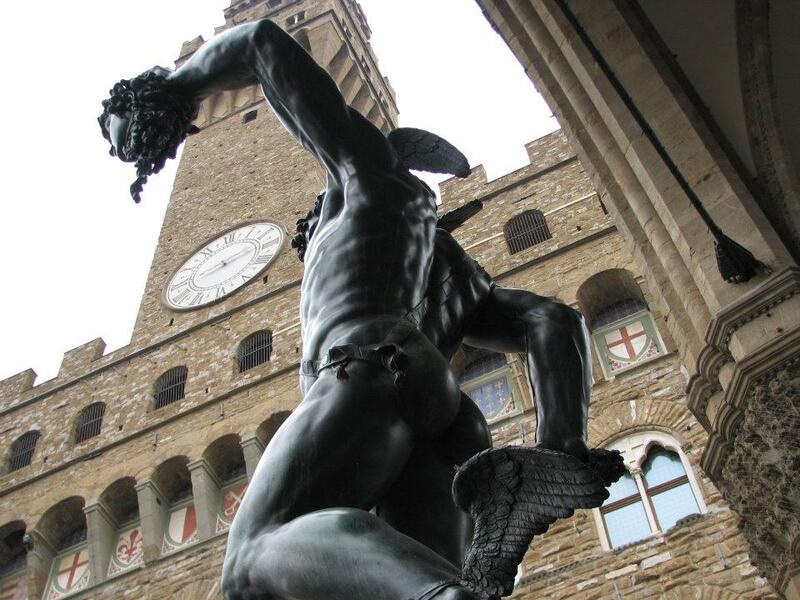 Perseus holds the head of Medusa (Cellini, 1554) in a gesture of conquest, a warning to enemies of Cosimo I: “Beware this will happen to you.” Near Perseus, numerous ancient Roman statues stand in the Loggia dei Lanzi (di Orcagna, 1382). 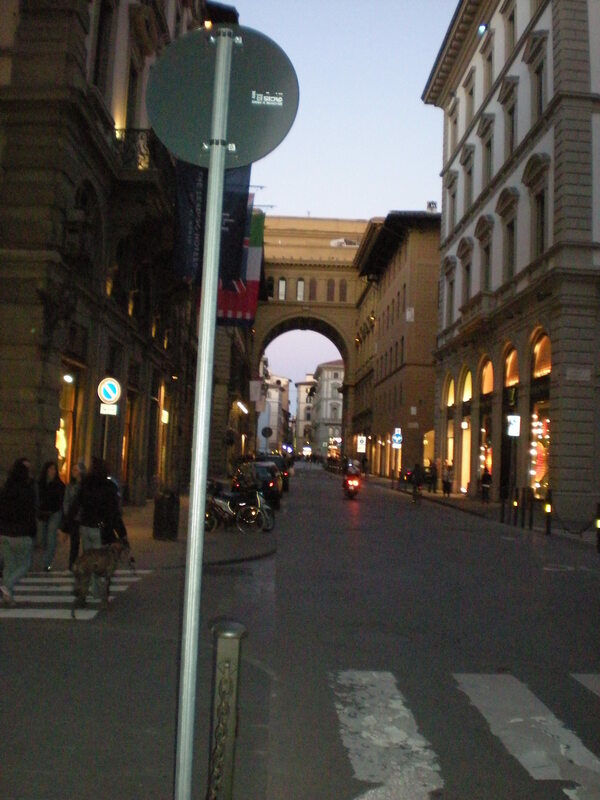 At dusk, we arrived at the Piazza della Republica, the exact center of Florence. 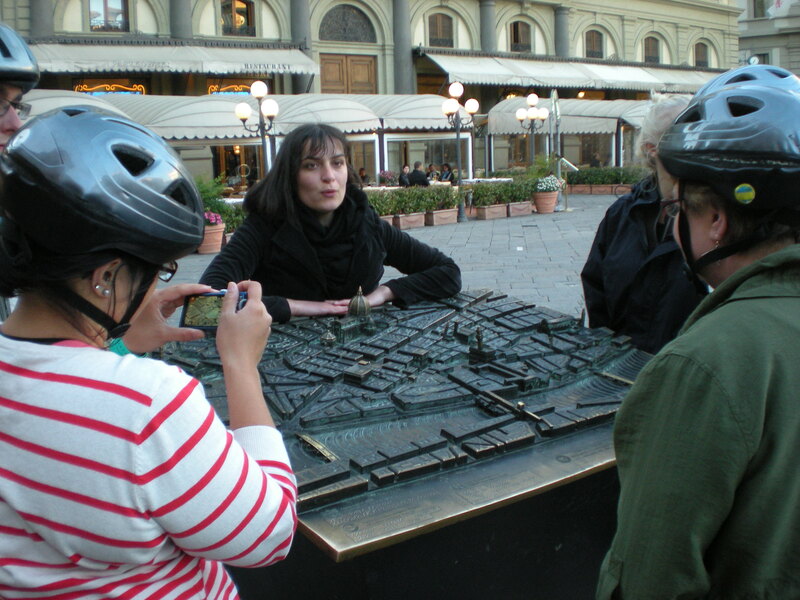 Here Valentina showed us a cast iron map of old Florence and pointed out where we had ridden on our bike tour. 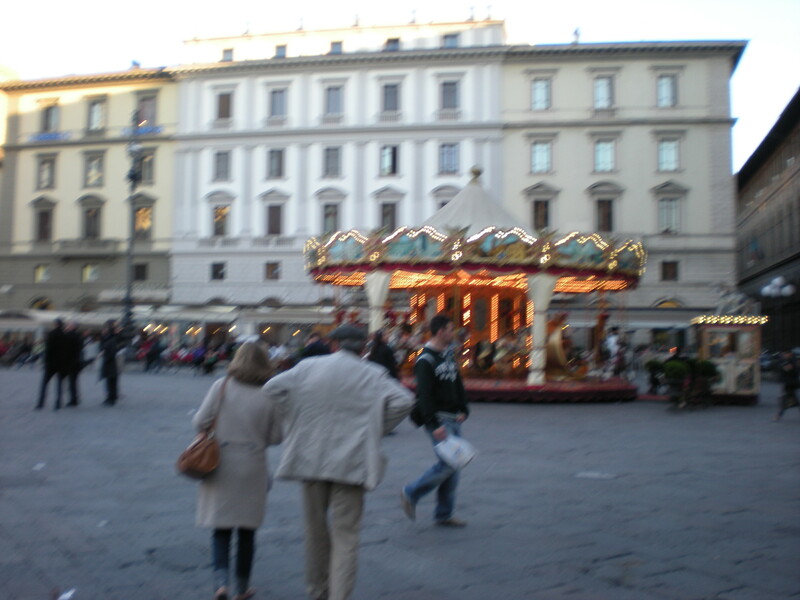 Across the piazza we saw a marvelous merry-go-round giving rides to children and care-free adults . 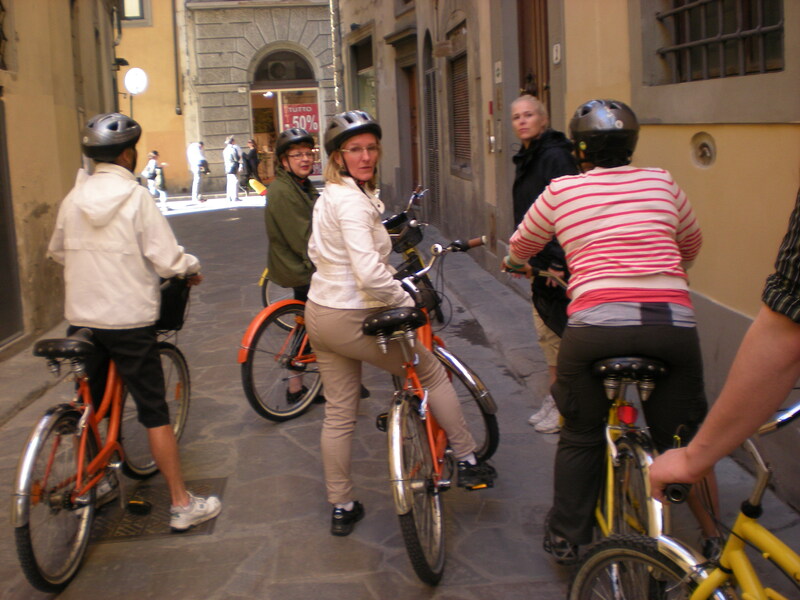 Minutes later we parked our bikes, said good-bye to Valentina, then wandered through cobbled alleys back to the Piazza della Signoria on our way to the train station. We saw and heard the ubiquitous musical groups beginning their evening performances. The lights of the piazza, the sounds of the merry-go-round, and the musicians contributed to the pleasant after-glow feeling we had about our bike tour in Florence. Thanks, Valentina! The bike tour was fun and very educational. You did a great job! 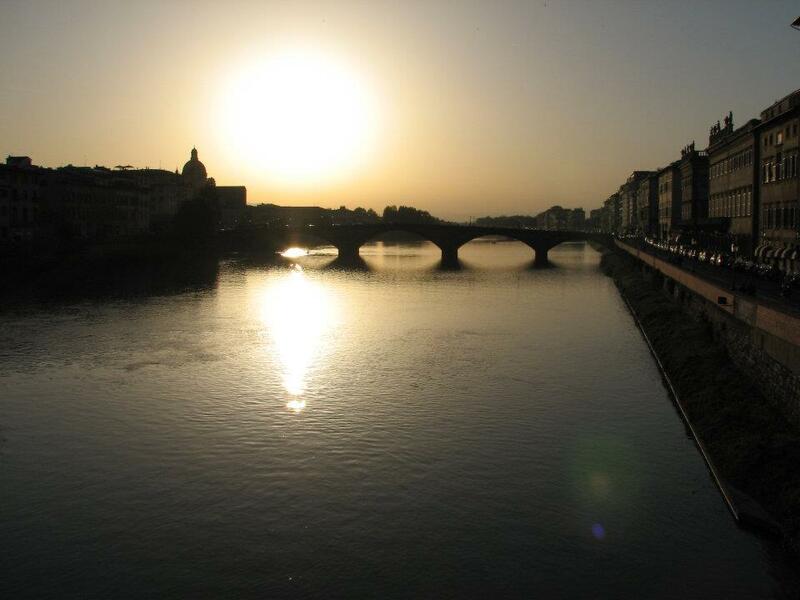 Christine Kolstad photo of the Arno River at sundown. 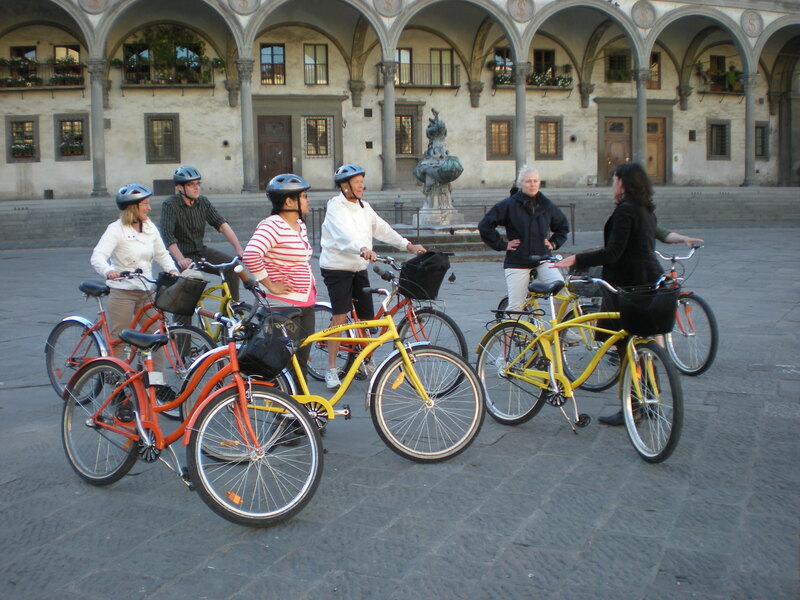 All in all, this bike tour was our favorite activity in Florence. 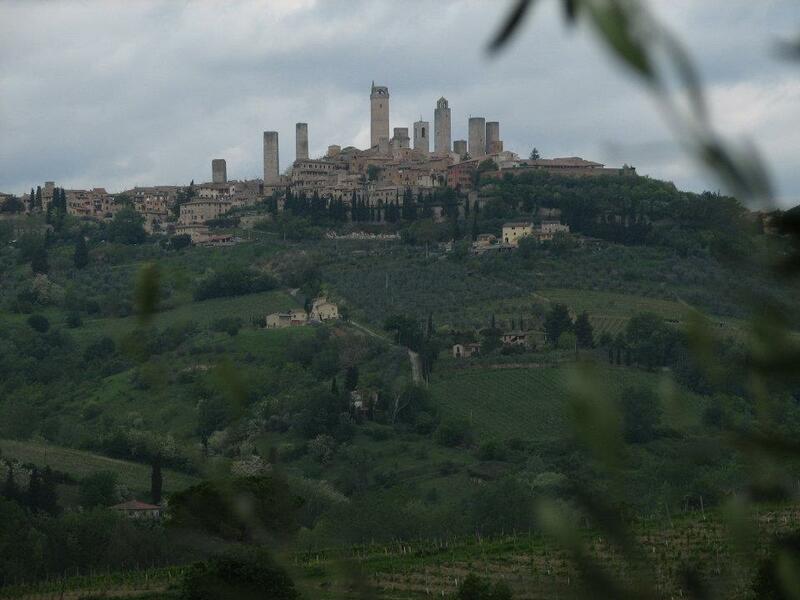 Try it if you travel to Florence.